Where does a cheese of this caliber originate? England? France? Well, this beautiful cheddar was born in the USA, at the Grafton Village Cheese Company in the rolling hills of southern Vermont. This artisan cheese house is renowned for its cheddar products and revered both domestically and internationally. They are part of a new wave of American farmhouse cheesemakers who have been energizing our taste buds with distinctive traditionally-made cheeses for well over a decade. This fantastic cheddar has aged for 100 days, but what you are about to taste is the culmination of more than just those many weeks of patient and proper aging. You're about to experience artisan cheesemaking at its best. We chose this cheddar because it's extraordinarily flavorful and lacks the bitterness that is characteristic of many aged cheddars. Although this bitterness is often associated with aged cheddar, maître fromagers and affineurs confirm that this is an undesirable characteristic—a sign of second-rate cheese making and/or less desirable milk. A well-made cheddar will acquire depth in its flavor without bitterness. We know you'll be impressed by its complexity and intensity, by its exceedingly long and delicious finish and a sweetness that is remarkable for cheddar. 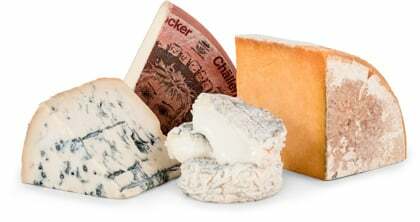 We painstakingly select cheeses for you each month that are high quality and intensely flavorful. These characteristics are hallmarks of Grafton’s creations. Cheesemakers at the Grafton creamery use approximately ten pounds of milk to make one pound of savory cheddar. (Kind of explains why high quality cheeses are so expensive, doesn't it?) The raw milk comes from select herds of Jersey cows known for their extraordinarily creamy, high butterfat content milk which both adds to the cheddar's flavor and supports the aging process. There aren't too many Jersey herds left in the U.S. Because their yield is so much lower than that of the now much more common black and white Holstein, their popularity in the mass-production market has waned. But when it comes to making masterful cheeses, Jerseys are sacred cows. The Grafton Village Cheese Company does things the old-fashioned, natural way—by hand—so it's not surprising that they use milk from this increasingly rare and prized breed to make their wonderful cheeses. Scott Fletcher, Grafton's alchemist and skilled affineur, has been, as he puts it, "teaching milk how to be cheese for over thirty years." Scott employs five other cheesemakers who cherish the ancient process used at Grafton and, like Scott, apply it with passion and precision. Aging is a very important part in making a classic cheese. Managing this process perfectly is the true test of an expert cheesemaker. The passage of time under controlled conditions enables a cheese to take on specific characteristics that set it apart from others. 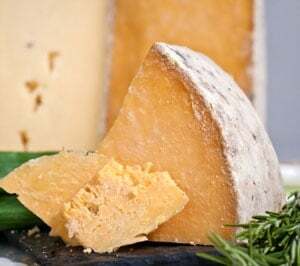 Time makes cheddar more crumbly in texture and gives it a greater concentration of salts and acids, which is what provides its characteristic tanginess or sharpness, often called the "bite." Truly great cheddars, like Grafton’s, are aged naturally so that they also retain a creamy smoothness. Before they go to market, each lot is tested and tasted by the cheesemakers. As Scott explains, "At Grafton, quality control is a paramount virtue." Getting to feast on the fruits of their labor on a regular basis as part of the job is a task for which many would gladly volunteer. Made from unpasteurized cow’s milk, Grafton Village Maple Smoked Cheddar has been cold-smoked over smoldering maplewood chips for up to four hours. Once you taste it, you’ll find the familiar nuttiness of cheddar with a sweet and smoky flavor. Extremely versatile, try it on salads, in cheese sauces, on sandwiches, and as a snack. Any way you slice it, its great flavor and excellent finish will make you yearn for more. Try pairing it with full-flavored beers like brown ales, or porters and medium bodied red wines like Pinot Noirs and Merlots.